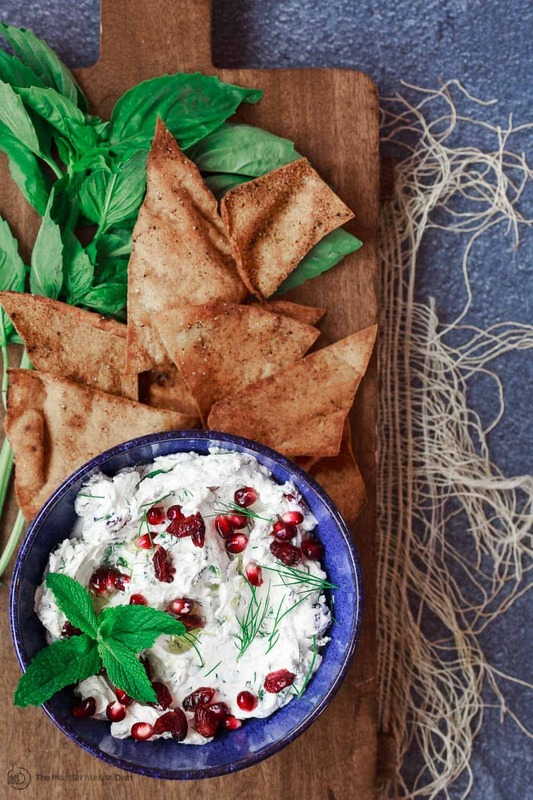 Take your party dip game to the next level with this easy labneh recipe and homemade pita chips! Sour cream may be most people’s choice as the base for party dips and spreads. Me? You probably guessed it; I much prefer Greek yogurt. Better yet, Labneh! 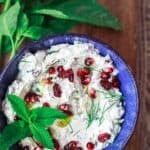 Revered for its slight tang, and perfectly thick and creamy consistency, Labneh (Middle Eastern yogurt cheese) makes the perfect base for a lucious party dip. And because it’s stinking easy to make (here’s my homemade labneh recipe, by the way), it’s a constant presence in my fridge. Naturally, I make a lot of use out of it! 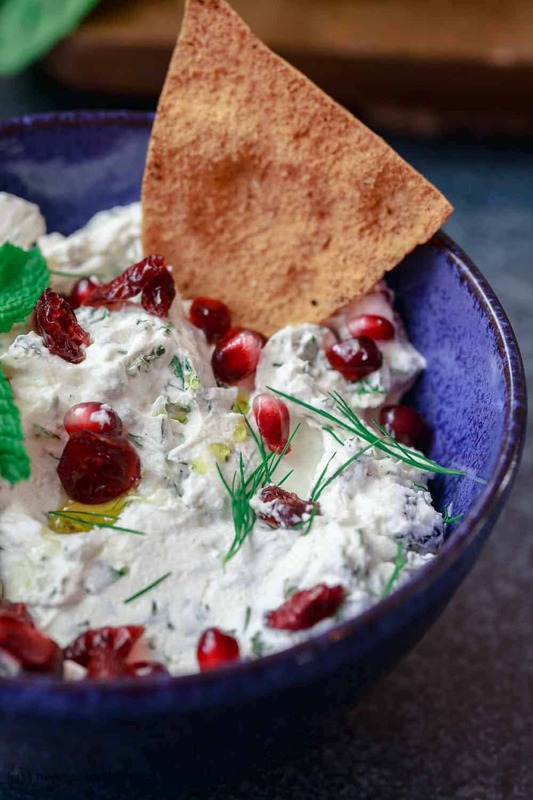 This easy cranberry and herb labneh recipe is a party favorite. I can’t believe it’s taken me this long to share it! The gist: labneh , combined with lots of fresh herbs–mint, basil, and dill–a good handful of dried cranberries, and a generous drizzle of my favorite finishing oil, Early Harvest extra virgin olive oil. You can make your own labneh yogurt cheese using whole milk yogurt, here’s how again. Or, feel free to use quality store-bought labneh (or labne). The bonus today is how to make your own pita chips…because why not?! If making your own homemade labneh (so easy and highly recommended), do that at least 24 hours in advance. Follow this homemade labneh recipe. Preheat oven to 375 degrees F. Line a large baking sheet with parchment paper and set aside for now. Open the pitas and pull the halves apart along the seams. Using kitchen shears, cut the pita into triangles or strips (1-inch or so wide). Toss the bread in a large bowl with the oil, a generous pinch of salt (scant 1 tsp), and the sumac. Taste and adjust salt or sumac to your liking. Spread pita triangles pieces on the prepared sheet pan and bake until golden brown, about 10 minutes or so (watch carefully, and rotate pan half-way through). 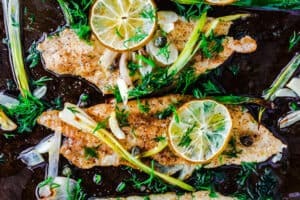 Remove from the oven and set aside for now. Make the herbed labneh dip. Place the labneh ingredients in one large bowl (expect the pomegranate seeds, if using), mix with a spoon until everything is well combined. Taste and adjust salt or spices to your liking. 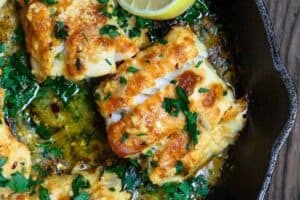 Add a little more lemon juice or olive oil, if you like. Mix again. 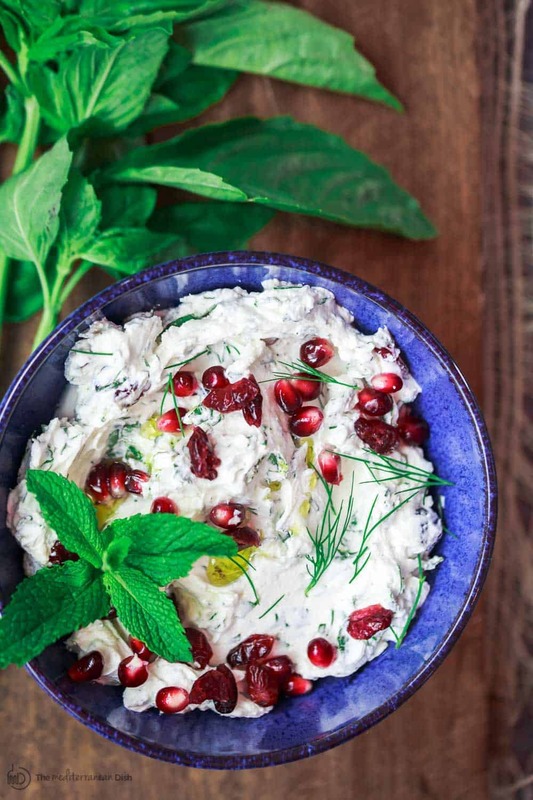 Transfer the herbed labneh to a serving bowl and garnish with mint leaves, more cranberries and the pomegranate seeds. 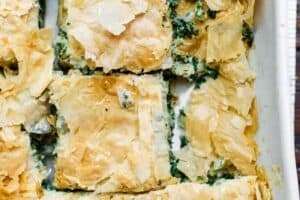 Enjoy with the homemade pita chips. Cooking Tip: This recipe can be adapted using quality Greek yogurt, however, the dip will be looser as labneh is thicker than Greek yogurt. Recommended for this Recipe: Our Early Harvest Extra Virgin Olive Oil. I love Labneh and make it often, sometimes from cow’s milk and sometimes from goat’s milk. They’re both delicious. 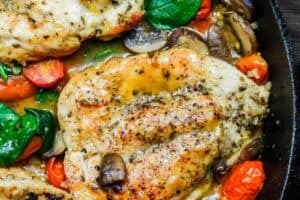 I love all the herbs that you added here, especially dill (my fav). I have never added pomegranates to it and I think it is a brilliant idea. 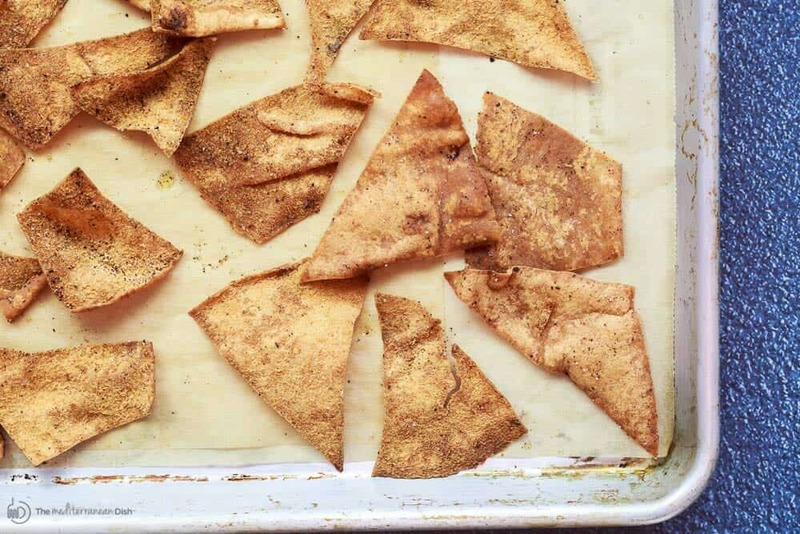 Pita chips with olive oil and sumac sounds super delicious too. 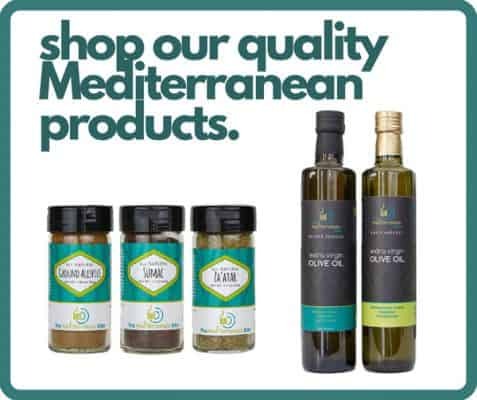 BTW congrats on launching sale of mediterranean spices and olive oils. Awesome! I have a thing for homemade dip and lately I’ve been craving a creamy dip like this! 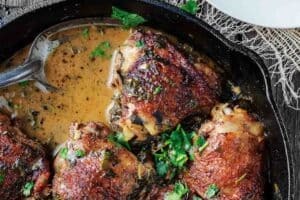 This is the perfect appetizer to serve for game day and the holidays! Glad you like this one, Jessica! Thanks! Thanks so much, Hannah! This is a favorite! These last couple of years I’ve gotten in the habit of using Greek yogurt in place of sour cream—it just tastes better to me. This dip is perfect for a social gathering!